It was created by Jean-Claude Delville from IFF, and he was expected to make a light but lasting perfume, what was a hard task to do. The perfumer found its formula in floral-aldehyde accord and presented a transparent fragrance with green floral and sharp aldehyde notes. The perfume is very light, easy to wear and at the same time tenacious. It achieved success regardless of very limited advertising and promotional support. The composition is created around the ginger lily, also known as a butterfly lily, a Himalayan large-petalled white flower. Growing in harsh high mountains climate, this plant blooms for only a few weeks in the spring time, and each flower lives only for a few hours, what makes it difficult, almost impossible, to extract the oil. An IFF pioneering researcher, Dr. Braja Mookherjee, found a way to analyse the oil structure using the 'living-flower' technique, and to copy the fragrance of the ginger lily, what enabled the industrial production. 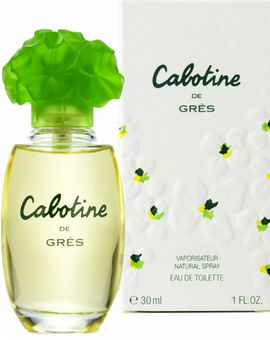 Cabotine is the first perfume which contains ginger lily in its composition. The top notes contain blackcurrant buds, pear, plum and corriander. The heart is composed of rose, tuberose, ylang-ylang, ginger lily, hyacinth, heliotrop, fresia, violet and iris. The base notes are cedarwood, vanilla, tonka bean, cybet, musk and amber. The perfume was created in 1990. The bottle, whose stopper was turned into a shape of flower, was created by Thierry Lecoule.